The Thompson Falls softball team is honoring former coach Randy Pirker, who died in May following a battle with cancer. The Bluehawks are wearing a memorial sticker on their helmets. Thompson Falls has created these T-shirts and sweatshirts in memory of former softball coach Randy Pirker, featuring one of his catchphrases: "Rock on, girls." MISSOULA — The Thompson Falls softball team is honoring longtime coach Randy Pirker, 57, who died in May following a battle with cancer, by dedicating its 2019 season to him. 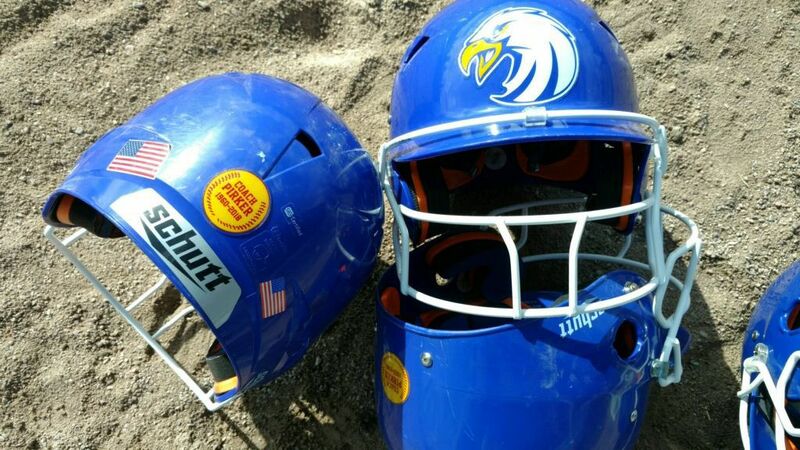 The Bluehawks will wear memorial stickers on their batting helmets and catcher's masks. The sticker is a yellow softball with red seams and the words “Coach Pirker 1960-2018,” because he preferred to be called Coach instead of Randy, according to second-year softball head coach Jared Koskela. The Bluehawks also have T-shirts and sweatshirts with one of Pirker's catchphrases — "Rock on, girls" — superimposed on top of the Thompson Falls logo along with "Coach Pirker (1960-2018)." Pirker, a 1978 Thompson Falls grad, coached the Bluehawks to the 2010 State B-C title and to runner-up finishes in 2005 and 2008. He stepped down as the head coach following his stage four pancreatic cancer diagnosis in August 2017 but remained on the staff for the spring 2018 season as a volunteer assistant when Koskela took over. "He was influential in the area when I was growing up," said Koskela, a 2002 Thompson Falls grad. "I never had him as a coach, but I always knew about him. The year I took over, we grew together. I figured this was the right thing to do. Anything I can control, he'll be a part of it." Pirker coached for 21 seasons at Thompson Falls, including 14 as the head coach. The Bluehawks canceled their season in 2012 and 2017 because of lack of numbers, but they came back last spring and have increased their numbers this year from 12 to 15. They're coming off a 3-13 season in which they started to win games near the end of the year after getting blown out by the run-rule early on. They bring back seven starters, and Koskela said the majority of the girls had known Pirker going back to the youth softball program in the area, which Pirker led and which Koskela has since taken over. He added: "It's good softball came back before he died. It's not peaking right now, but it's going to flourish in Thompson Falls once again." There have been discussions at Thompson Falls about naming the softball field in memory of Pirker, although no decision has been reached and no timetable for a decision is known, according to Thompson Falls athletic director Jake Mickelson. He added that the school would like to do something this spring, in addition to what the softball team is doing, to honor Pirker and keep his memory alive. “He had a huge softball program and built that and maintained that for quite a few years and had Thompson Falls as a powerhouse,” Mickelson said. “He was the backbone of those teams. He had a hard-nosed style about him. Last year, with him going through what he did, I think it was helpful for him with getting the program kick-started again and an inspiration for him for softball to be back. The football team, also coached by Koskela, wore the softball stickers in remembrance of Pirker on their helmets this past fall. Pirker played on the 1974 and 1975 state champion football teams at Thompson Falls, Mickelson said, and was an assistant coach for the team from time to time over the years. In addition to coaching, Pirker also worked in Thompson Falls as a sales associate at a realty company. THOMPSON FALLS — Randy Pirker called the girls down to the end of the dugout.